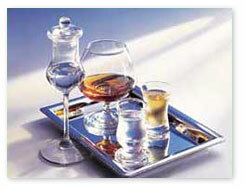 Spirits made in Germany are subject to EC law and the stringent directives governing their production processes. A popular generic term for hard liquor consumed ice-cold and in one swoop (often chased by a beer) is Schnaps which means a “gulp” in old German — and that is exactly how it should be drunk. In contrast, a Brandweinis a brandy enjoyed warm and in small measures to let the flavor and aroma unfold. Tradition and innovation yield an immense number of specialties. From grain spirit (made from rye, buckwheat, oats or barley) and fruit spirits of various kinds (made from the fermented pulp or juice or by mashing in alcohol and subsequently distilling) to other fine spirits and liqueurs (including herbal, spice, fruit and bitter liqueurs). Product Gallery: Here you can find the most common brands in this category from Germany and neighboring countries with a similar cuisine exported to North America. 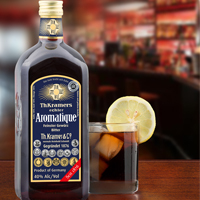 Aromatique, a delicious, refreshing, and enlivening spiced liquor from the State of Thuringia, best consumed cool. Korn: a clear grain spirit, not to be confused with the English word corn, which is Mais (maize) in German. It’s a good neutral liquor similar to a vodka and ideal served as a beer chaser. Schnaps are always served on their own in small slender shot glasses, never with mixers. Obstler or Obstwasser (fruit brandy): a distilled spirits produced exclusively from fruit juices, which ferment naturally without the addition of sugar or alcohol. Egg Liqour: One famous brand is Verpoorten bases in Bonn, which produces an iconic bottle with egg nogg and brandy. Goldwasser: a specialty from the city of Danzig (Gdansk) in Poland.